beneficial in the fight against prostate cancer. Behind the initials DIM lies a powerful, natural metabolite called 3,3′-Diindolylmethane. This compound is one of the active principles responsible for the benefits of cruciferous vegetables such as Brussels sprouts, broccoli and kale. These crucifers share a number of common features including the ability to reduce oestrogen levels and protect against certain hormone-dependent cancers. Widely-studied, the anti-oestrogen properties and anti-cancer potential of cruciferous vegetables have been attributed to active principles such as DIM and its precursor I3C (indole-3-carbinol). 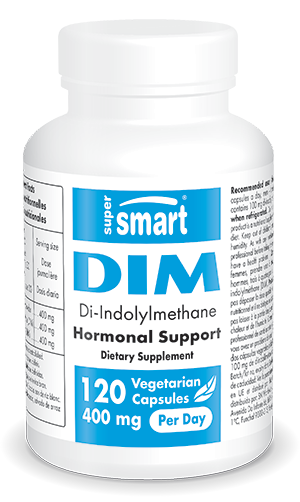 The result of digesting I3C, DIM is a natural, active metabolite involved in balancing hormone levels. More specifically, it influences the metabolism of oestrogens - steroid hormones secreted by the ovaries, adrenal cortex, testicles and placenta. Present in both women and men, these hormones play different roles within the body. However, despite their importance, they can be present at excessive levels in the body and cause a number of problems. Hormone imbalance can cause fatigue, migraines, muscle and joint pain, mood swings, reduced libido, irregular and painful periods, as well as certain prostate problems. Excessive oestrogen can also promote the accumulation of fat cells, particularly on the stomach and thighs. Scientists are interested in DIM for its ability to prevent these harmful effects, particularly its anti-oestrogen properties which help naturally reduce oestrogen levels in men and women. As a result of its anti-oestrogen properties, DIM has attracted scientific interest for its potential to prevent and treat certain hormone-dependent cancers. Excess levels of oestrogen can promote the development of several types of cancer including breast cancer in women and prostate cancer in men. By modulating levels of these hormones, DIM may thus constitute a valuable aid in reducing the risk of breast and prostate cancer. Studies also suggest that DIM encourages the elimination of certain cancer cells. This effect is possibly related to increased 2-dehydroxylation of oestrogens, a process that helps rebalance the ratio of ‘good’ to ‘bad’ oestrogens in the body. The benefits of 3,3′-Diindolylmethane are now available in the form of vegetarian capsules. Ideal for both women and men who wish to lower their oestrogen levels naturally, this dietary supplement provides 100mg of DIM per capsule and is offered at a daily recommended dose of 1-2 capsules for women and 3-4 capsules for men. This dose can be adapted according to individual needs and the advice of your therapist. Along with DIM, the protective effects of other active principles found in cruciferous vegetables are also available in supplement form, including glucosinolates, and in particular the anti-cancer potential of sulforaphane glucosinolate. Each vegetarian capsule provides 100 mg di-indolylmethane (DIM).